Step-by-step instructions on how to pay and process Orders, manually. • When an User selected Bank as payment method. • When an User cancelled the payment process (on the payment gateway) and you received the payment through other method. 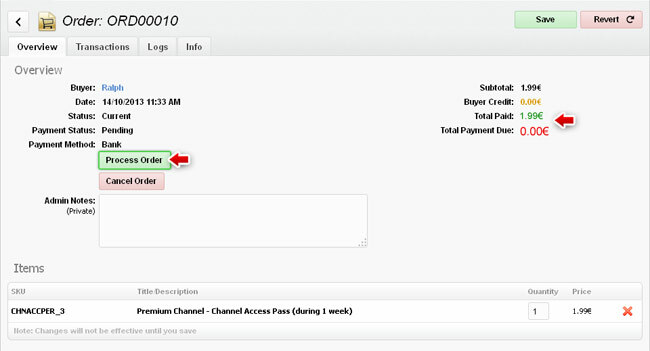 • When an User paid through a payment gateway (like PayPal) but the payment gateway was not able to redirect it back to the WebTV because of connectivity problems. Look for the desired "current" Order and edit it (click the corresponding pencil icon). Before processing an Order, you must pay it; this means that the "Total Payment Due" must be 0. If the "Total Payment Due" is not 0, then you need to add a payment trasaction for the corresponding amount. Normally, the payment transaction correspond to the actual payment you received from the User; for example, when the User paid through your bank account and you were able to verify that payment. 1. Click the "New Payment Transaction" button. • Description: A brief description for your reference. • Payment method: Select the payment method used on the transaction; for example, Bank. • Amount: This will, normally, match the "Total Payment Due" amount; however, you can have several transactions that add up until the "Total Payment Due" equals 0. NOTE: Transactions with amount = 0 will be discarded. 3. After adding the transactions Save the Order. Once the Order was saved, if the transaction amounts added up to match the "Total Payment Due", then the value should be equal to 0, and the "Total Paid" should reflect the total of the payment transactions. • Its status changed to "Processed". • The payment status changed to "Paid". • If the User purchased a content access pass, the access was granted. • If the User recharged its credit, the corresponding amount was added to its current credit balance.